Jon, me and Nick-the-Cam flew into Tam to shoot Mountain of Spirits (MoS), an ageing idea of mine brushed down, spruced up and slotted into the ‘let’s do it’ category. Unable to find a cast, Jon and I worked through our inherent modesty and decided to be in it ourselves. In 2003 Desert Riders ended with me crashing out as Jon and I neared Garet with the intention of climbing it. So our film had a theme. Indeed my interest in Garet ran back to my first Saharan trip in ’82. Tam airport car park 3am and a whole bunch of French and German fly-ins dispersed with us into the desert, to regroup a fortnight later for the flight back, some limping, some in slings, most with suntans and chi-chi headware. By the skin of our teeth we managed to slip thousands of pounds of camera gear and other restricted items through the scanners and past Customs, and spent the night in a house in Tam. Wanting to keep it simple and being hard men of the desert (or attracted to that idea on film!) the original plan had been to do it all out the back of a pickup; us three in the back, the crew up front. But the permit people were appalled at the idea: “Tourists are NOT goats” they exclaimed, so a station wagon was roped in. Just as well, the brief sessions filming in the back of the bache proved it would have been a rough fortnight indeed. 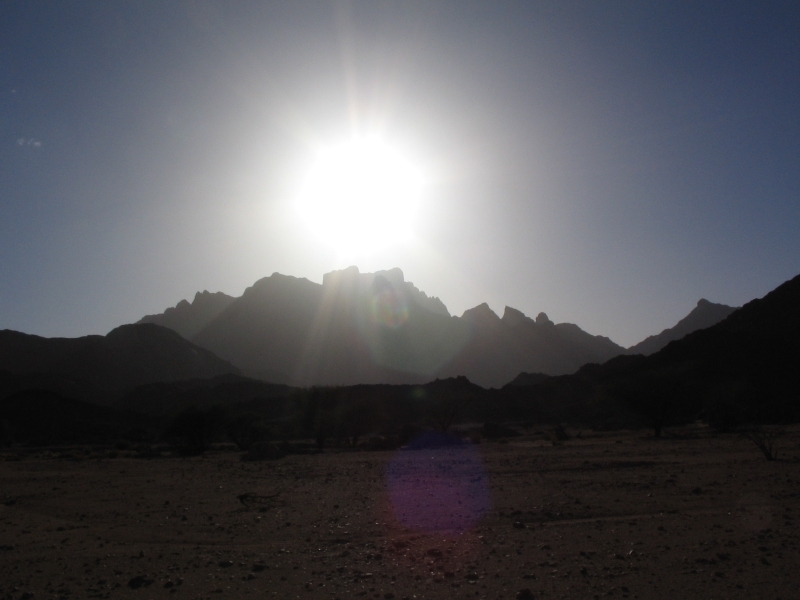 We headed up to Tahat (2908m), Atakor west side, for a warm-up slog into the Saharan Death Zone but luck – or was it the djenoun? – was against us. Lot of rain in 2005 and amazingly streams were still running out of the Hoggar. Tahat base camp we could have made at a pinch, but on up to Assekrem was washed-out (never easy at the best of times). Not wanting to lose time at the sharp end of the trip, we grabbed a few shots, scooted back to town and took the regular way up to Assekrem for a cozy night in the lodge and the dramatic sunset/sunrise. The descent to Hirafok is still a spring-munching crawl at times. In places smoother than when I last did it in 2000, elsewhere cut up by the recent run-off. Still, as I was already finding, you sure notice a whole lot more when you’re not driving. Nevertheless, I was reminded that the Atakor is a grim and rough place where you’re jammed on the pistes. If it wasn’t for Assekrem being a ‘must-do’, I wouldn’t bother when you compare it to the lovely sandstone and granite ranges nearby. By now I was gripped by le grippe and with time lost, was not fired up enough to shoot over to Telertheba (2455m) to see how far we’d get up that one. Almost certainly we would not have made the summit, climbed by Conrad Killian in the 1920s, but it would have been fun trying. So we thought, let’s head straight for Garet and get stuck in; it was the focus of the film after all. Filming properly and not in my practiced fast-and-loose style, was taking a whole lot more time, but part of the project’s purpose was a curiosity to appraise the results of shooting a film with proper attention to detail. We took the Hassi Dehine piste, camping near the well. Being end of Ramadan I bought a goat off some nomads and our crew spent the the rest of the night tearing it to bits and cooking it up. The liver (or some such organ) grilled in fat-wraps was very tasty. 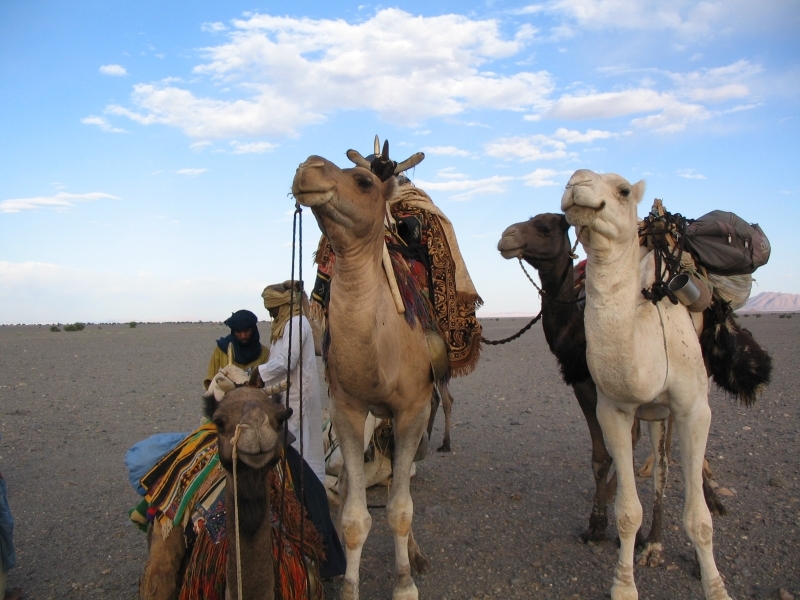 We met up with the nomads next morning and gave them a lift to another nearby camp for some festive socialising. 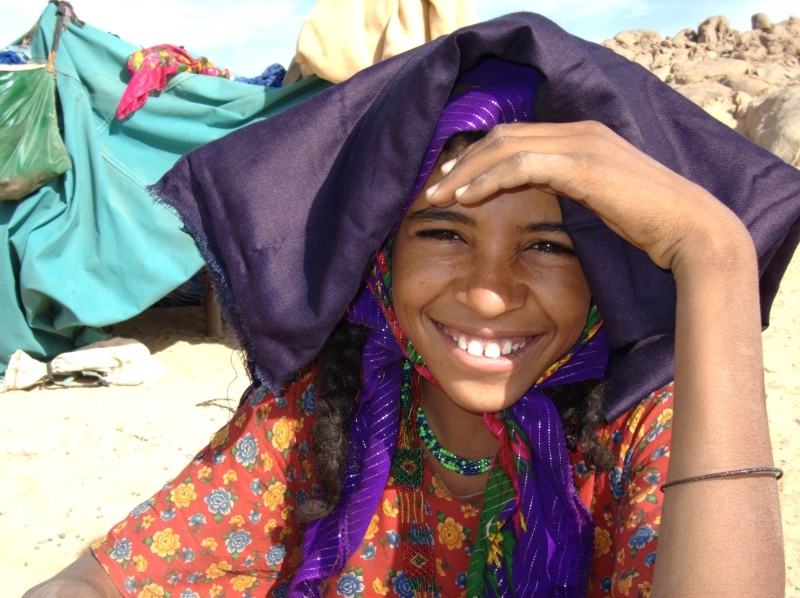 They all knew Mohamed our guide – or his late father, a nomad of note from the In Salah area. It’s a lovely drive up the Tefedest west side as always and after a while the distinctive turret of Garet juts up from the ridge line. Over the next few days we ended up driving right round the Tefedest, and Garet is always prominent, even 100kms away. It may not be the highest point but, like the Matterhorn or Ayers Rock, its elemental presence casts a spell of its own. water we could carry plus Abdelsalaam with another waterbag on his head. Even then, I had a suspicion water was going to be an issue and when we got to the base camp waypoint we texted for another bag to be brought up. Water was low but Mohamed knew of a well on the other side of the Igharhar valley. 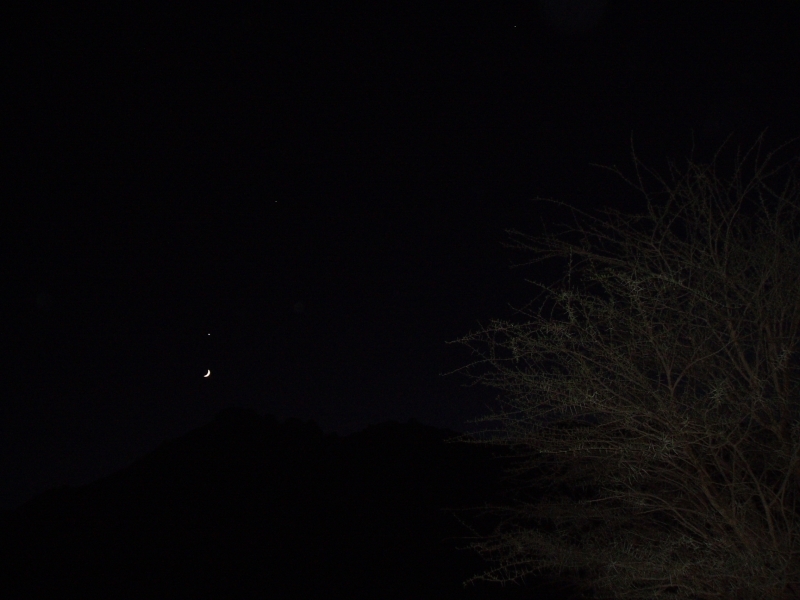 As darkness fell the crescent moon emerged from behind Garet’s flanks, hanging directly below Venus – a diabolical alignment considered inauspicious since before the days of Babylon. 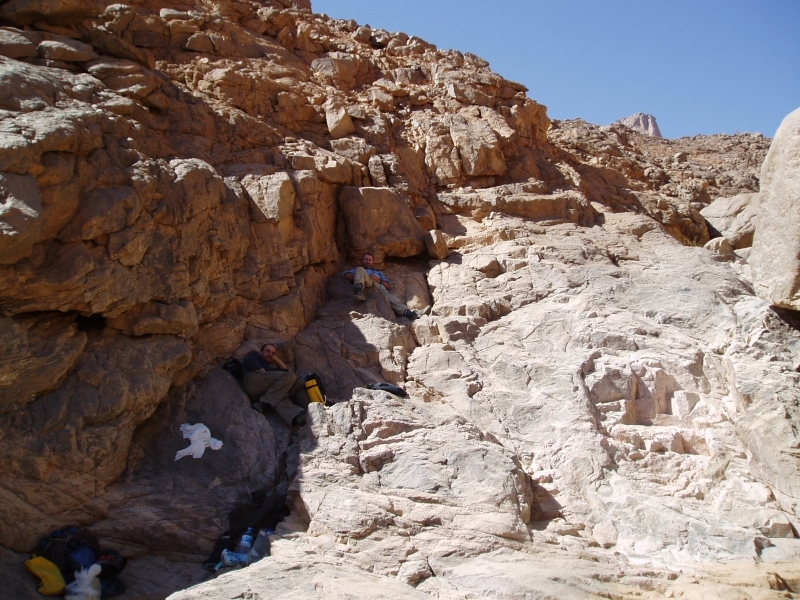 We loaded up and set off around dawn, up the boulder-chocked east oued, hoping we were following an Italian route description I’d found in a climbing magazine. 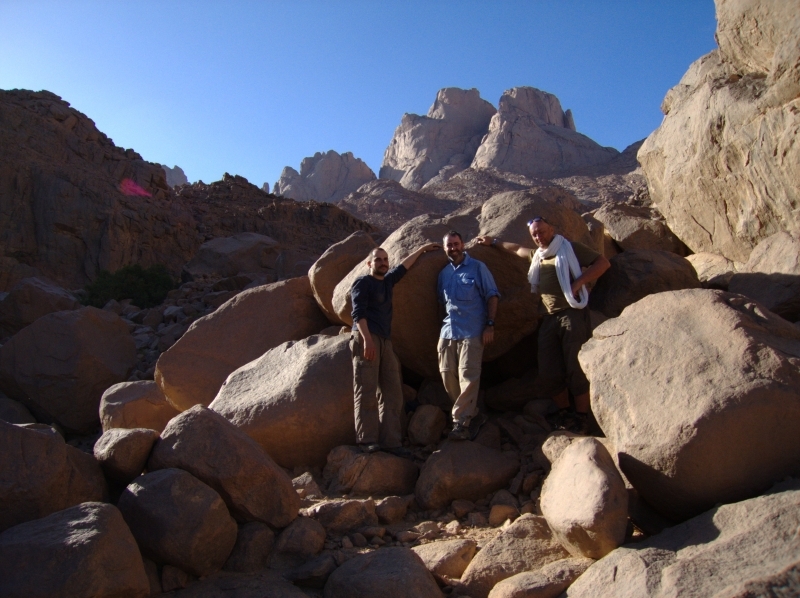 It quickly reminded me of our attempt on Jebel Uweinat early in 2004 where the broken terrain at the end of a much longer approach walk has worn us down. Here on Garet. we were soon hogging the shade, detesting our overnight backpacks and stopping for breathers every 20 mins. Clearly our recent colds and lack of exercise on other mountains was having an effect, added to the suspicion that this was not going to be the pleasingly videogenic cakewalk we’d imagined. Between filming and panting it took us most of the day to get just 400m above the plain. Another 1000m of ascent over less than 2km remained with, as far as we knew, a pitch of roping up a chimney and a traverse followed by a scramble up a cleft onto the summit plateau. A big French party had come through in April, on the 60th anniversary of Roger Frison-Roche’s first ascent (his, via an obsolete western route) so how hard could it be for a lightweight alpine-style crew? The problem (or my excuse) was we’d misunderstood the translated Italian and French descriptions: a ‘bivouac’ to which the French party had portaged water was probably the 400m height we’d just attained, not the morning’s base camp. It was from the bivi, rested and replete with water, that one set out to summit and return to base in a long, 14-hour day. As on Uweinat, water was the problem, along with the fatiguing terrain. Here, I did not want to take a similar chance and plough on regardless to the point where we’d run out of water and food to stagger back. A braver attitude perhaps and one that can get results sooner, but the reality of an accident up here would be tiresome at the very least; knowing when to turn back was something I’d learned on my first Saharan trip. Better to accept it as a recce and use what time we had left to nip up north to the equally intriguing Amguid crater trek. So we bounced back down from rock to rock in half the time, picking up what we’d left on the way. There were a few gueltas and next time I’d take a chance and tap them with a good water filter to save carrying the stuff. Back at the base camp it was getting dark and our water hadn’t been delivered, although there was a pot of still-warm rice. After a breather we loaded up and hiked back to the cars in the dark. Turned out the well on the far side wasn’t usable and now water was a priority. 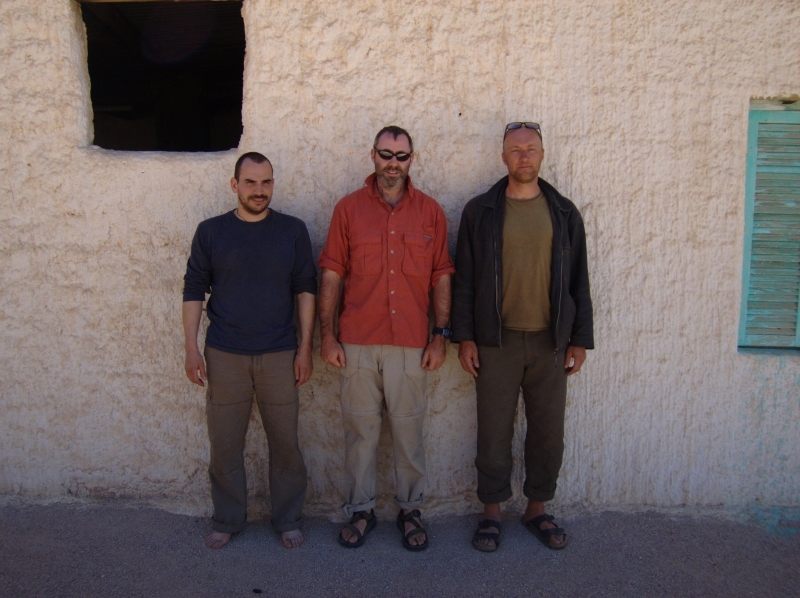 Next morning we headed for the reliable nomad’s wells on the edge of the Gharis or Mouydir escarpment in whose canyon’s Group 1 of the 2003 hostages had been stashed and then released in a raid. 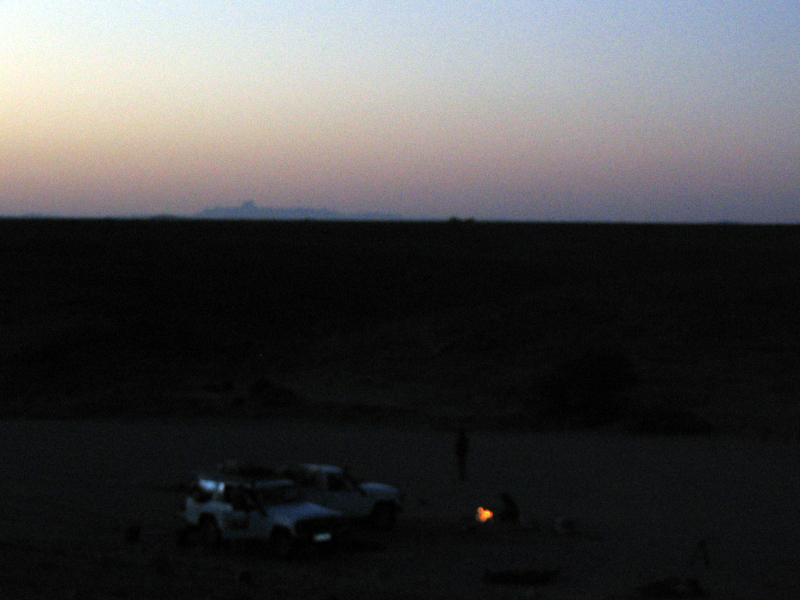 We had a good wash at the Tabariq well as a quick rain shower passed over, let some nomads use the Thuraya to get their tea on, and that night, halfway to the Foum Mahek fuel dump, the far distant profile of Garet loomed in the dusk, like a passing submarine. The djenoun were not finished with us yet. 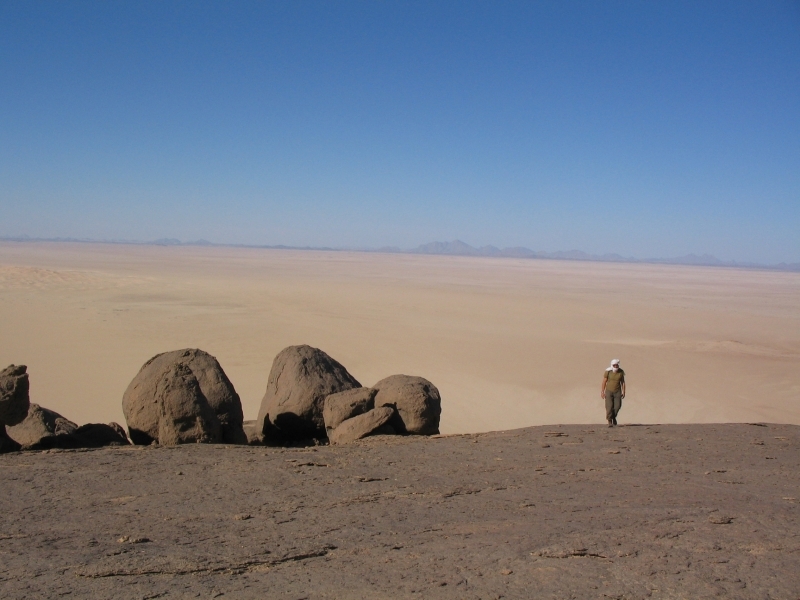 We headed for a fuel cache I’d left among some rocks in 2002 for the Desert Riders (we never got that far). I like to think I may have even recognised it without GPS. The six jerries were mostly full – some had leaked under pressure and a plastic water bottle cracked at the first touch. This stuff had endured three summers, including the notoriously hot 2003 season which spread as far as Europe (41°C in London, remember…). Fueled up and with a nice ‘cache recovery’ shot in the bag, we set off into Foum Mahek – at last some new terrain for me. As we ate lunch under a shade tree a pickup pulled up fast on seeing us. Smugglers said Mohamed. Turns out they were more alarmed by us then we by them (same story at Kemal al Din in the Gilf in 2004). 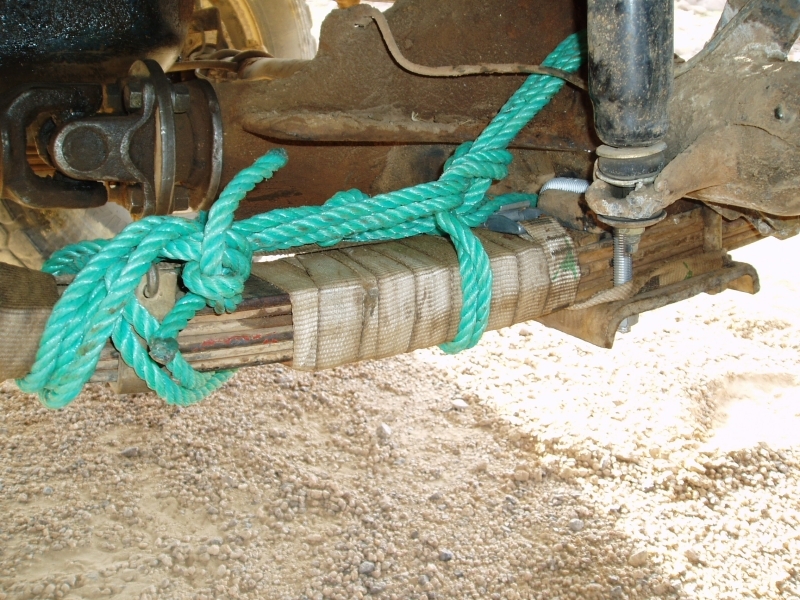 Their new Tojo pickup – bought from the proceeds of cig smuggling – still had the dockside stock numbers scrawled on the windscreen, but they were actually just searching for a lost camel. The news they had was that a checkpoint at a pass on the way to the crater was making passage difficult for travellers and was turning back tourists. A day or two getting official permission may have brought them round, but time was short and the fact that we were also carrying clearly non-amateur filming gear may have got us into trouble. OK, forget that idea too. Looks like it was becoming one of those trips… I suppose I was overdue for one. We trudged back south along the edge of the scarp and curved round towards the highway. Next day near Asseksam well we were mirror-flashed by some nomads. No souvenir-n-scrounging ploy this, but a request to transport a sick old guy to the daily Tam bus at Moulay Lahsene. No probs, it was right on our way, passing through the rounded inselbergs and bright granite sands west the Tidikmar that reminded me of our memorable ride through the Taffassasset down to Erg Killian in 2003. At Moulay they still circle the old marabout’s tomb three times for good luck. When I first spotted people doing that in the 80s I thought they were merely hoons. For us though, it was getting too late to invoke the blessings of Lahsene to save our project. 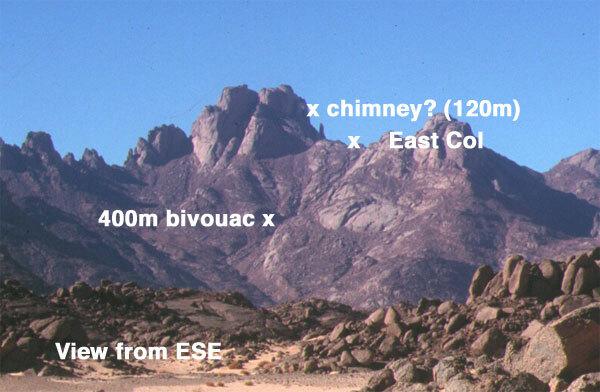 Hoping to shake off the djinns, we headed west round the back of Tesnou through more exfoliating granite domes and camped near ‘Elephant Rock’, so named by some Italian climbers who’d pegged up the sides. Here we were free of the corrugations and run-off channels of the Hoggar and Tefedest, out in the open and felt the much better for it. 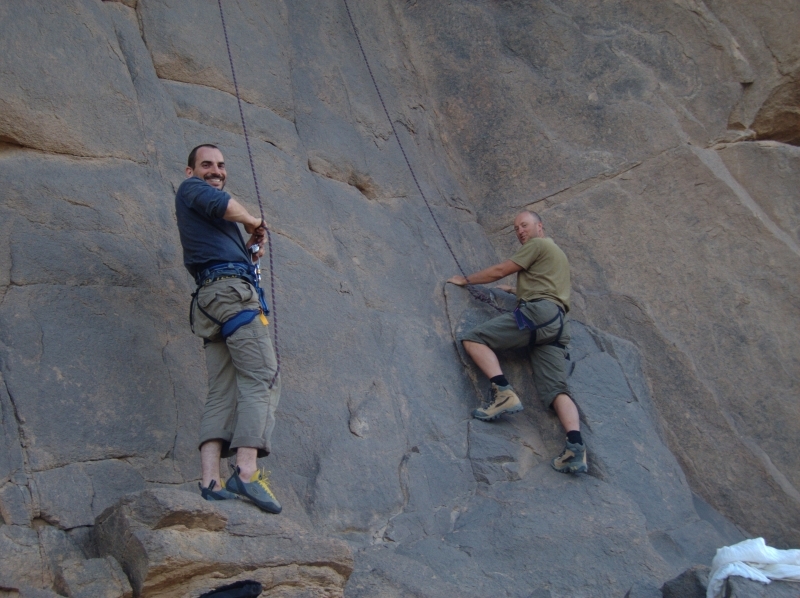 Nothing for it now but to take an idle 3-day drive back south to In Amguel oued and Tam; 10 o’clock mornings, 3 o’clock evenings, exploring, lazing about, filming, even some rock climbing. It was a nice spin down to a frustrating trip. Though there seemed little point, we shot what was to have been the spine-chilling opening sequence of MoS where a fire-lit nomad (Mohamed in a blanket) spookly recounted the legend of the lost boys of Garet, lured to their deaths by an mendacious mouflon (barbary sheep or waddan; ‘Oudane’ is the Tuareg name for Garet). Their trapped spirits were symbolised by Garet’s twin turrets. 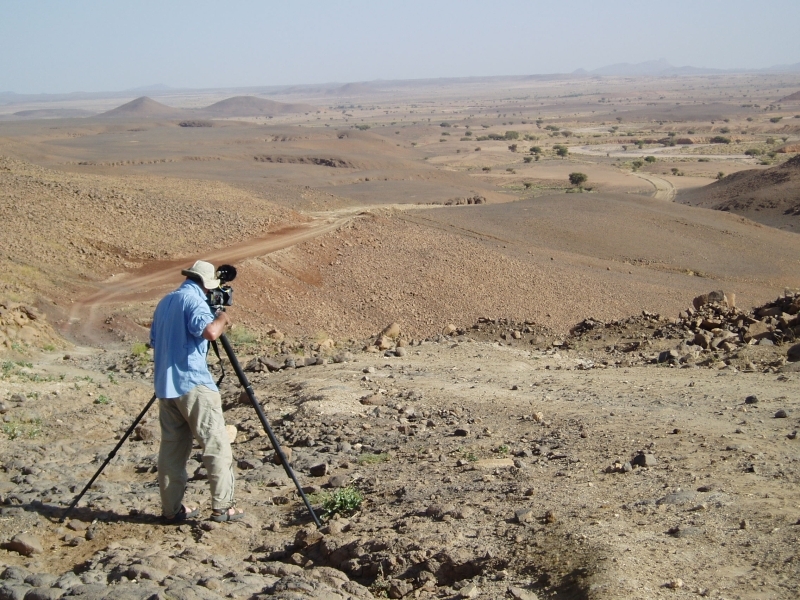 One day near a lunchtime hill Jon found a carefully-engraved Tuareg spear head, and another day we dozed in a broad oued sprinkled with lighter-than-water pumice, flushed out of the Hoggar by the recent floods. Despite the strict protocols laid out in my book, a rounded piece of aerated lava now sits alongside the bath at home. Another sunny evening in the dunes west of Ouassdert well, Jon and I even managed to get the dunes ‘singing’, a phenomenon I’d read and written of but never experienced. Indeed it sounded like the passing rumble of a distant propeller plane, but was clearly caused by out feet disturbing the sands. With a couple of new intros for the Desert Driving 2 dvd caught on tape, we rolled back into Tam, had a great feed and hoped on the 3am redeye back to Paris. Bit of an expensive flop, this trip, but you got to try these things and as always there was a positive side. We saw some nice new desert in the last few days west of the Highway and I was impressed with Mohamed’s enthusiasm for exploring – not the usual quick-buck/tramline guide mentality. We’ve since cooked up a couple of meaty tours for the coming year, and though a film about not climbing a mountain through lethargy and disorganisation is probably not worth the prolonged effort of editing, doubtless Garet will be in touch for another crack. This entry was posted in Uncategorized and tagged ahnet, assekrem, atakor massif, Carnets Saharienes, Conrad Killian, djenoun, Foum Mahek, Garet el Djenoun, Gharis, hassi dehine, hoggar, mountain of ghosts, mountain of spirits, Mouydir, Ouassdert well, Roger Frison-Roche, tahat, tedefest, Telertheba, tesnou on October 3, 2015 by Chris S.